As with any pillar of democracy, the first order of business pertaining to the Winnipeg 2014 civic election is selecting a hash tag for Twitter. The local twitterverse has settled on #Wpg14. It has the key elements: place (Wpg) and time (14). The fact that it pertains to an election is just assumed because nothing else significant is anticipated to happen in Winnipeg in 2014. Sure we could have included “elxn” in the hash tag, but that would have consumed an additional 4 valuable characters of Twitter’s arbitrary 140 character limit. Efficiency is good. Now that the hash tag is in the bag: bring on the contestants! It is still very early in the race, but a striking contrast as already emerged in how the candidates so far have gone about the business of applying for the job as mayor. Former city councillor/deputy mayor and lawyer Gord Steeves was the first out of the gate. In fact he was so first out of the gate that he broke election laws before the election even started, by renting a venue and purchasing a logo, signs, balloons, and a matching lapel pin some 7 months before the official campaign period began. His official campaign is also off to a rocky start, having failed to publicize his kickoff event to such a pitiful degree that less than 20 people showed up. I once read that the ideal room size is one that is small enough that every body can fit but some people are forced to stand. This being the case, my rec room may have been a better venue for Steeves’ launch event. This was without question a PR failure, and perhaps could have been averted by better use of social media. For example, Steeves has over 600 followers on twitter, but he mentioned this event in only one low-key tweet 3 days prior. Steeves’ poor organizational skills could perhaps be overlooked if he had an arsenal of policy ideas to get us thinking, but lacking anything so far in this regard, our entire impression of his campaign is based on a premature and possibly illegal announcement in October followed by an abysmally organized launch. Of the candidates so far, By far the most engaged on social media is political outsider Brian Bowman. Bowman has not one but TWO twitter accounts (which I believe is entirely unnecessary and slightly annoying). His official election twitter account has only slightly more followers than Steeves, but he actually engages others on twitter and he spammed those followers with dozens of tweets leading up to his kickoff, making damn sure that everybody was aware of it. Not only that, he recruited others to do the same. The result? A packed house at the Winnipeg Art Gallery (where there happened to be delicious cup cakes). He also has a well-designed web site that contains very little information about him or his ideas, but does make it very easy for you to sign up for emails, tweet your RSVP to his event, or donate money. In short, he is organized and extremely good at publicizing himself. Bowman, like Steeves, is a lawyer, but has the advantage of being a city hall outsider (sort of) and having the magic combination of generic good looks, charisma, and the ability to connect with people. These qualities have helped him draw a great deal of support from people who don’t really know him, despite having little in the way of concrete ideas, and give him a huge advantage over Gord Steeves. If Bowman can build on this with good ideas for the city, and parlay his social media muscles into name recognition among the masses, he will be a serious contender. Meanwhile, Paula Havixbeck came out swinging, with actual IDEAS the moment she signed up for the race. Idea #1: Get rid of the Executive Policy Committee at city hall. This is something I suggested in the past on Winnipeg Internet Pundits, and that automatically makes it a great idea. Idea #2: Increase the number of council meetings. Requiring our councilors to work harder and apply more oversight to things like construction contracts seems like an awfully good idea in light of recent boondoggles. Idea #3: Fix more roads without more money. I am always skeptical of “do more with less” promises, but she thinks she can do this by better managing construction tenders. Maybe. We’ll see. Paula may not be the social media darling that Bowman is, but she certainly has a presence there as well, with over 2000 followers on her regular account and a brand new (as of today) election twitter account. She had a low-key kickoff today at city hall that was better attended than Steeves’, though nothing near as elaborate as Bowman’s. At the end of the day, I believe substance will win over splash, and that puts Havixbeck as the one to beat so far in my books. She has name recognition and experience on city council, yet was battling Katz and the status quo enough that she can credibly argue that she has been trying to be part of the solution, as opposed to being part of the problem. Bowman wants to increase access to data at city hall, and has also come out in support of reopening Portage and Main to pedestrians. It’s good to see some substance seeping out of his campaign. It would be even nicer if his web site focused more on ideas than promotion and fundraising, but perhaps that will come. Poor Steeves meanwhile has neither splash nor substance at this point. He does have name recognition however, and I assume he has a team behind him that, if they get their act in gear, can create a more positive profile for him throughout this race. That won’t matter, however, if he doesn’t have fresh ideas to run on. Expect to see more people enter the race, including the mayor himself. Sam Katz has been floating his own ideas about EPC and other things, but I fear it’s too late for the affable old mayor. I also expect Judy Wasylycia-Leis to sign up. Why? Because she followed me on twitter yesterday, and has followed another 30 people since then. She is building her own social media presence for a reason, and she has also been visible at numerous community events over the past year. I think she wants to run again and I think there is definitely a large chunk of support out there for her. Without question this will be a far more interesting race than the last election. It’s a wide open race with an eclectic mix of personalities, and already some interesting ideas are emerging. I hope for much more. 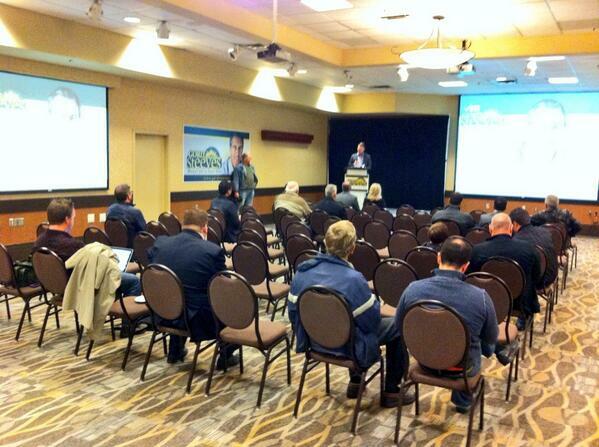 If you happen to be on twitter, watch it all unfold at #Wpg14. Do you consider Dr. Robert Falcon Ouellette a “fringe candidate”? I would call him a long shot or an underdog, but not fringe. I’m not sure what the distinctiion is, but in my mind it has something to do with credibility, credentials and a reasonable platform.